There’s been a bit of discussion on Twitter this morning with @megankenna and @thefashioncloud at the prohibitively high cost of Wifi in and around the EU quarter in Brussels. Many conferences are organised in hotels and the cost for wifi can be up to €25 per day. This, I fear, is at least as much thanks to the lack of competition among hotels and venues in the EU quarter as anything else! Anyway, so what’s the solution? Aloft Brussels Schuman has free wifi, so if you’re wanting participants at an EU event to be tweeting then that might be the best bet. Alternatively take matters in hand as a regular visitor to Brussels. I always have my Huawei E585 with me on any journey – £60 unlocked from eBay and then €5 for 500mb of data on JIM Mobile in Belgium (“Megasurf” here). Mobile Vikings is another option in Belgium. Up to 5 gadgets can be connected to the E585 simultaneously and, using it for the last 4 months, I have been very pleased. Outside of a conference venue there are a number of places with free wifi in Brussels – any Exki café has good wifi, and the one on Rue Froissart, just down from the Justus Lipsius building, has plenty of seating and electric plugs too. Around Place Lux Urbizone is a patchy option. There are further tips on Dopplr here. Anyway, do add your comments below, and name and shame the places where wifi is too costly! My Brussels wifi tip is to sign up for a Thalys TheCard (it’s free). On days when you’re travelling by Thalys, you can then use the Thalys Lounge, which is slightly hidden at the south of Brussels Midi station underneath platform 3. When you enter the lounge, as for the wifi password, and they’ll give you a login to their hotspot valid for 2 hours. Not sure if they’ll give you a 2nd one or not if you’re there for ages. However, given the lack of powerpoints here (I’ve yet to find them…), that might limit your stay in the lounge more than the wifi! I love my mifi – use it whenever I’m travelling to avoid hideous roaming or hotel wifi charges. 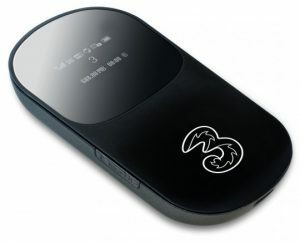 Three’s just launched the E586, allegedly with a longer battery life, and faster connection (though that, of course, depends on whether the network operates on HSDPA+. http://prepaidwithdata.wikia.com/wiki/Pay_as_you_go_sim_with_data_Wiki has a user generated list of pay as you go mobile operators, along with pricing and details of packages available.